Would You Like A Little History With Your Turkey and Mashed Potatoes? While most of us in America are happily sitting down to a table filled with favorite foods of all types, saying grace with our families and friends, thanking a higher power for all of our blessings, it might be good for us to know the fuller story of the history of the Pilgrims and the American Indians, from another, truer perspective than the one we were spoon-fed by educators over the past 350 years. The real story might not sit well with some, might surprise others, or might be a reminder of how the truth of an event can change drastically in the re-telling of it by people with various and sundry motives – kind of like the telling of the story of what exactly happened in Ferguson, MO, this past summer, and what the grand jury there was spoon-fed by the prosecutor in order to get the result he wanted all along, a “no true bill” decision. …a very different story, indeed. To summarize, from here, “Since 1921, the 300th year after the first Thanksgiving, the Commonwealth of Massachusetts stages an annual reenactment of Thanksgiving. People gather at a church on the site of the Pilgrims’ original meeting house, in 17th century costume. After prayers and a sermon, they march to Plymouth Rock. This annual event had become a tourist attraction. Of course, there are two, or more, sides to every story, but it would have been nice if we had all been given THIS side of the story when growing up so we could have weighed all sides and made up our own minds as to the veracity of the only version we were taught from a young age. 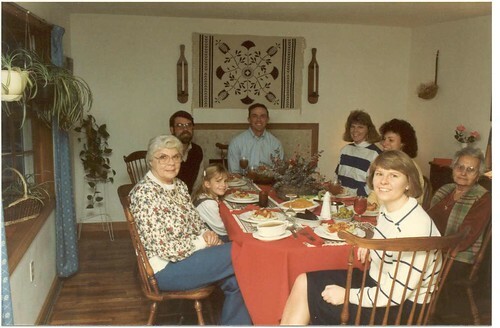 8 Responses to Would You Like A Little History With Your Turkey and Mashed Potatoes? Thanks. Very enlightening. It’s a shame we are fed so much garbage/propaganda in our school history classes. The Indians might have been “savages” by European standards but is our greed based society really better and happier? I think not. I found it a bit odd that the writer of some of that article was a bit of a royalist. He terms Wamsutta of royal blood, though the Indians wouldn’t have seen themselves that way. The position of Massasoit (which is a leader, not a person’s name) is hereditary – but I wouldn’t call it royal. For example, unlike the English government of the time, the Wampanoag were a matriarchal society, with all wealth and lands passing down to the daughters. It was a confusing time of uneasy relationships. The Wampanoag, having lost 90% of their people to illness, most likely would have needed the settlers to survive. I mean, lets say that when the Pilgrims landed there were 30,000 Wampanoag spread thru the area. Afterwards, there would have been only around 300! And that’s spread out and with some of them still in ill health. 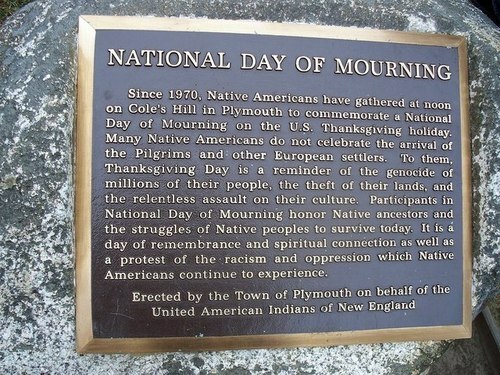 Oh, and if I remember correctly, it wasn’t the Pilgrims who sold some of the Indians into slavery. It was the Puritans, who came about 20 years later. So when Mr. James took the nickname of Wamsutta, he was honoring the original from the 1600’s in Massachusetts. The history is grim – so much of history is grim. I look at the grim history being written today. Your research is amazing. I’m always impressed. My family has made it to the mountain. The joy is unstoppable. Um, wow. I guess I prefer to think that, as happens so often, the truth is probably some where in the middle – and I say that as a registered American Indian. Maybe life isn’t all that dry and couched in scholarly tones most of the time, but I think I prefer the much labored upon history that is being brought together over time at Wikipedia. Frank James’ speech (he is not Wamsutta) is more than a little angry and self-serving, not to mention it ranges freely, taking and ignoring what it wishes from history. Bex, Nice photo. Thanks for sharing. Interesting article. On going illusions. Thanks Sandy… you are a true friend. And you know how much I’m thinking of you right now, after all you’ve been through these past two weeks. You are always there sitting inside my heart, in your special place. Thank you…I learned a lot that I didn’t know about.. Your blogs always make my mind work .